Hello, from a very warm Auckland! Summer has come to these parts with a short-wearing shock, and my dreams of cold weather have retreated along with my hot water bottles and faux fur throws. Until April, at least. Well, first up, I pronounce it ‘jail’. Being a history mad kid, I grew up fascinated by a family tree that hung in our house. I was so attached to it that hangs in my own house now. I loved reading all the carefully written names, imagining the sort of lives my ancestors led; the sort of places they lived and travelled to, the world events they were caught up in. But one name in particular always stood out: Jael Godolphin Boscawen. I don’t know why, but her name evoked thoughts of adventure and excitement. It was an exotic sounding name in a world of Annes and Marys. Surely she was an interesting woman? I decided that Jael would be the perfect name for the character in the new story I was creating. That was so many years ago now, and Jael has been in my head for longer than she hasn’t. And despite being connected physically and literally to two Jael’s, I wasn’t sure they had anything in common at all until I recently did a little bit of internetting. Jael Goldophin was born in 1647, during the English Civil War. She was the daughter of an English nobleman and politician who was a Royalist. He actually had the lease on the Scilly Isles. As you do. Always wanted to go there! She married another politician, Edward Boscawen, who came from an ancient Cornish family of copper miners and together they had six children, three who survived, and one who actually married an author, Sir John Evelyn. 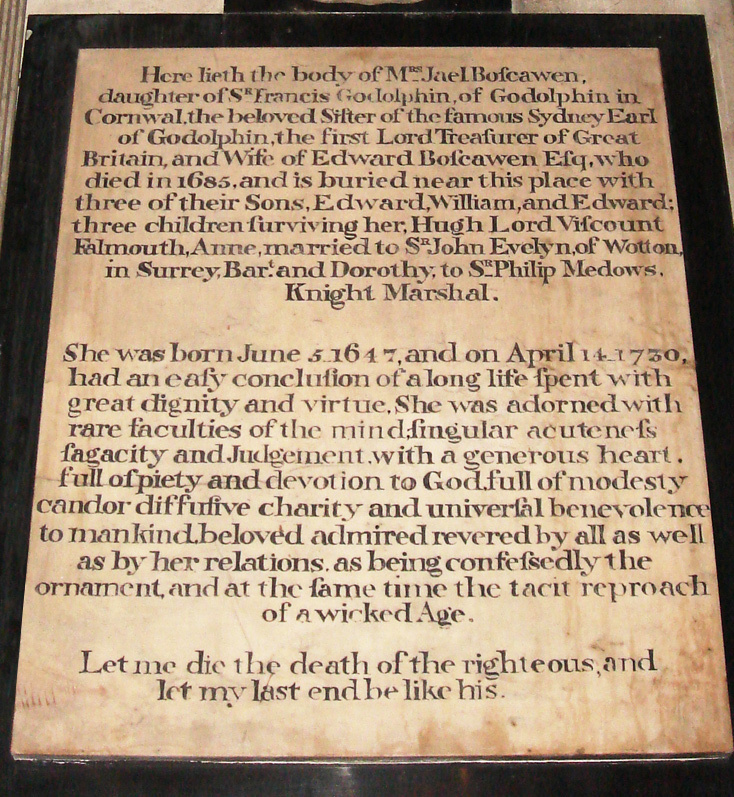 There’s nothing much to be found about her actual life bar what is revealed on her memorial stone which hangs in St Mary Abotts Parish Church in Kensington. It alludes to an interesting woman who stands out as someone who was ‘adorned with rare faculties of the mind, singular acuteness, sagacity and judgement,’ ‘candor’. Someone who was ‘beloved, admired, revered by all.’ So, it seems that Jael’s namesake was respected as a woman who had a good brain and was public about her use of it, so much so that it was one of the things remembered about her after her death. And in a time when women of a certain class were praised and admired for their gentle, agreeable femininity as they embroidered and gave birth and hosted parties, it sounds as though Jael Godolphin Boscawen stood out and was not afraid to. 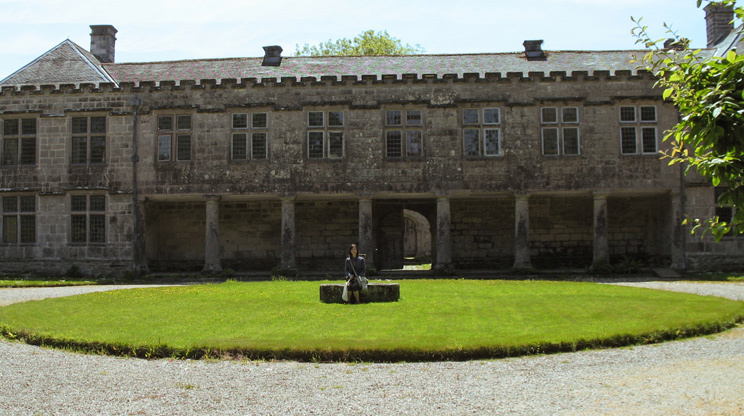 I actually visited the place of her birth, Godolphin House, in Godolphin, Cornwall 11 years ago (yes, that’s me in the photo with my tourist bag!). It’s a beautiful part of a beautiful part of England, and I thoroughly recommend a visit. So, there you go, there was a real Jael out there. Not quite the one I write about, but both Jael’s are a part of me in a small way, and I’m equally proud to be connected to both of them!